Zebra finches are really social little birds. When conditions are not right for breeding (usually when there’s not enough rain), they hang out in flocks of hundreds. And in the intimate mood the rain brings, groups break up into more manageable sizes of 10-20 birds, which still seems like a lot to me. 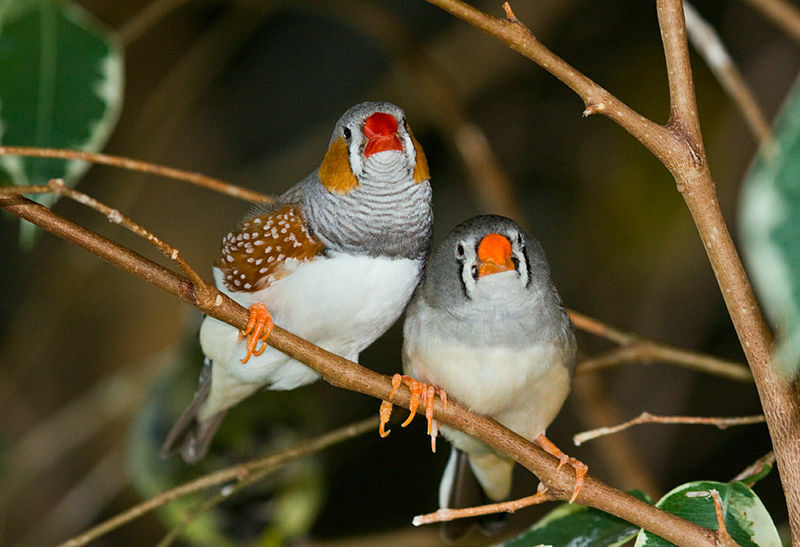 Although, if you’re the type to have a “quiet night in” with just a dozen or so of your closest friends, you may be able to relate to the gregarious zebra finch. 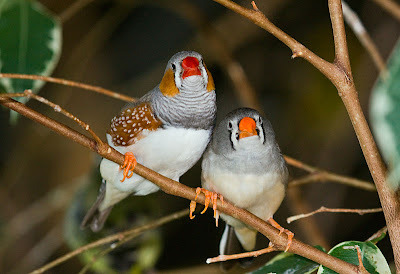 This is a zebra finch pair. Photo by Keith Gerstung, Wikimedia commons. same family (Estrildidae). Photo by Duncan McCaskill, Wikimedia commons. What makes some individuals more social than others? And what makes one individual change from being more social to less social (and vice versa)? 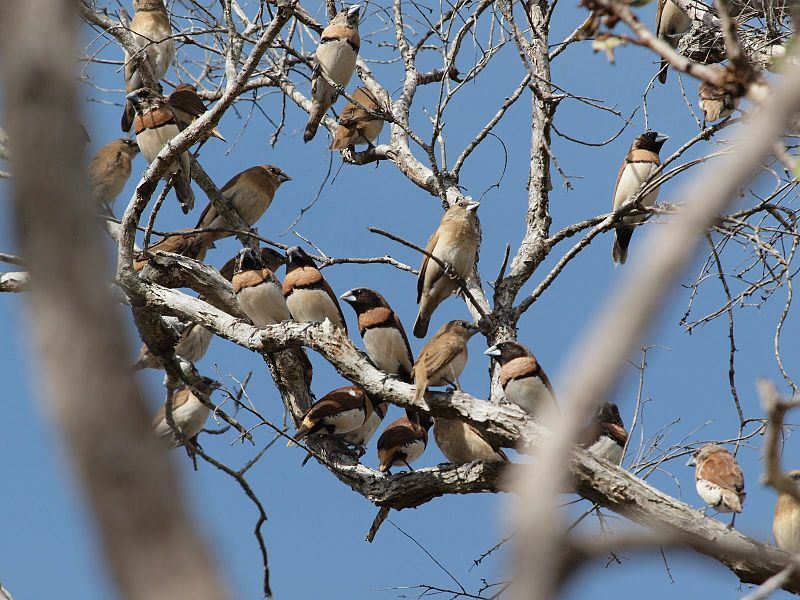 One of the secrets to sociality in birds may lie in a neuropeptide called vasotocin. Vasotocin is a chemical messenger in the brains of birds, reptiles, amphibians and fishes (very similar to vasopressin in mammals) and it is known to be involved in several social behaviors. Researchers from Indiana University (including Aubrey Kelly, Marcy Kingsbury, Sara Schrock, David Kabelik and Jim Goodson) and Bowdoin College (Kristin Hoffbuhr, Brandon Waxman and Rick Thompson) got together to explore if and how vasotocin may be involved in how social zebra finches are. of a brain section under the microscope. Kelly, et al. (2011) Hormones and Behavior. Chemical messengers, like vasotocin, generally don’t act equally on all parts of the brain, but rather have particular effects on specific brain regions. This is in part because certain chemicals are only produced by neurons (a type of brain cell) in some brain regions. Perhaps more importantly, the action of a chemical messenger is almost completely dependent on its receptors, and the receptors are also typically only located in specific brain regions. When you consider that neurons all project and talk to different areas of the brain, you can see that this system can get very complicated very quickly. Despite these complexities, this research team has narrowed in on two regions of the zebra finch brain that seem to be using vasotocin to regulate how social they are. The medial bed nucleus of the stria terminalis is a ridiculously long name for a brain region that is part of the extended amygdala (We’ll call it BSTm). Many neurons in the BSTm produce vasotocin (and are therefore called vasotocinergic neurons) and release the peptide in another brain area called the lateral septum (We’ll call it LS). The LS does not contain neurons that produce vasotocin (like the BSTm does), but instead contains neurons with vasotocin receptors, which vasotocin can bind to and take effect. Jim Goodson and another colleague, Yiwei Wang, had previously found that when zebra finches are allowed to socialize with other zebra finches, more of their vasotocinergic neurons in the BSTm become active. Could vasotocin produced in the BSTm and released in the LS underlie how social an animal is? If you were the zebra finch in the middle cage, which perch would you prefer to be on? Figure from Kelly, et al. (2011) Hormones and Behavior paper. One way to ask a zebra finch how social he’s feeling is to use a choice paradigm: that is, to put him in a cage with ten birds on one side, two birds on the other side, then see what side he hangs out on. The middle section (containing our bird of interest) contains a bunch of perches at different distances from the “flocks”. In this scenario, a zebra finch will sit on the perch next to the big flock on average 82% of the time, ‘cuz he’s social like that. But if the researcher injects a drug that blocks vasotocin receptors in the LS, he will sit on the perch next to the big flock on average 0% of the time. What do you think he does with all this free time? Typically, he sits on the perch next to the flock of two birds. So blocking vasotocin receptors in the LS seems to make zebra finches less social (but not asocial – If that were the case they would probably avoid both groups of birds). This suggests that more vasotocin binding to vasotocin receptors in the LS makes birds want to hang out with a large group. But, is the vasotocin that’s being released in this region and causing this behavior coming from the BSTm or another brain region? To figure this out, the researchers needed to look at (and experimentally alter) the vasotocin neurons in the BSTm. Vasotocin is a peptide, and peptides are produced by a process in which the instructions for producing the peptide on the DNA is transcribed onto a molecule of messenger RNA. The instructions on the messenger RNA are then used to build the peptide. A drug called an antisense oligonucleotide can bind to that messenger RNA and confuse the instructions so the peptide doesn’t get made as much. This kind of drug was used to reduce the amount of vasotocin produced by BSTm neurons. Birds that had less vasotocin produced in the BSTm spent less time on the perch next to the large group, and spent more time on the perch next to the small group, compared to birds with natural vasotocin levels. They also explored less and took longer to feed if a strange object was in the cage, indicating that they were anxious. Together, it looks like vasotocin produced by neurons in the BSTm and acting on receptors in the LS may increase sociality and reduce anxiety (maybe social anxiety?) in gregarious birds like zebra finches. When you’re at a party, do you find yourself the life of the party or are you more comfortable hanging out in the corner with a few friends? Maybe you’re feeling more social at one party and less social at another? Could we have a system in our brain similar to the zebra finches? We have BST and LS brain regions and we have vasopressin, which is a lot like vasotocin. Hmmm… I guess this could be something to break the ice with at your next social mixer. A very interesting and engaging way to look at things. These zebra finches are really sociable, that's what I have observed from my finches aviary...In my everyday seeing it I never saw it alone on a branch.